Vicky Kalogera, a Northwestern University physicist, took her week of much-needed vacation in Utah this past August. She promised her family she’d stay off of email for a week. It wasn’t a real promise, of course, but she was going to try. She’d arranged the perfect day for August 17. Her husband was going to take the kids hiking in Arches National Park while she’d spend the whole day at the spa. Right as she left her room, she just had to give her email a peep. The deluge brought the news: Telescopes and detectors across the world were making a monumental observation. “I canceled everything and ended up working nonstop since that moment,” she told Gizmodo. Today, physicists and astronomers around the world are announcing a whole new kind of gravitational wave signal at a National Science Foundation press conference in Washington, DC. 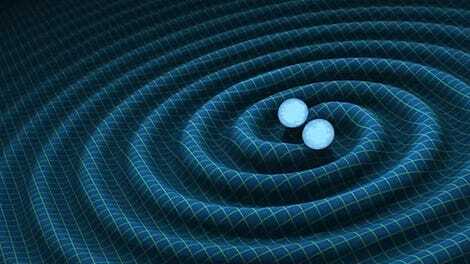 But it’s not just gravitational waves. 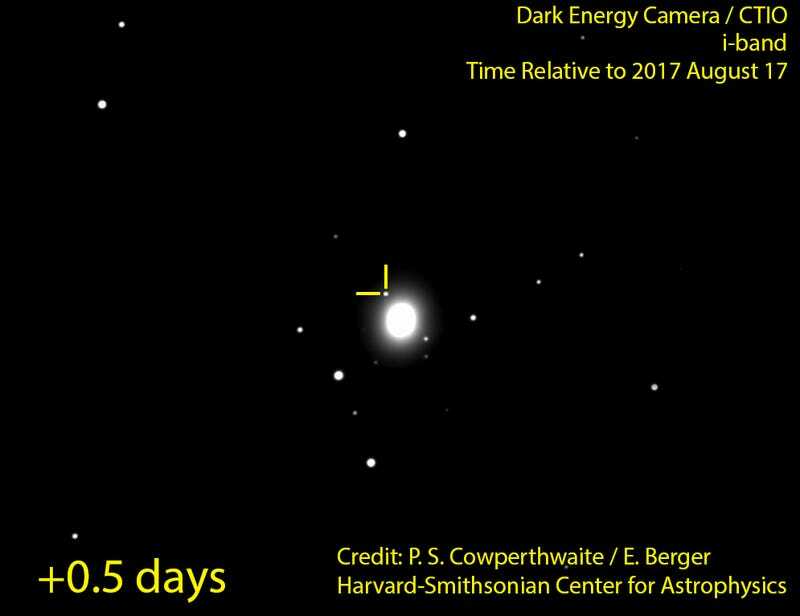 That August day, x-ray telescopes, visible light, radio telescopes, and gamma-ray telescopes all spotted a flash, one consistent with a pair of neutron stars swirling together, colliding and coalescing into a black hole. The observation, called a “kilonova,” simultaneously answered questions like “where did the heavy metal in our Universe come from” and “what causes some of the gamma-ray bursts scientists have observed since the 60s.” It also posed new ones. “We’re going to have a lot more to do moving forward,” said Kalogera. The Fermi Gamma-ray Space telescope started the dominos at 8:41 am EDT, detecting what NASA astrophysicist Julie McEnery called a “perfectly normal short gamma-ray burst,” a quick flash of invisible light from some distant source. 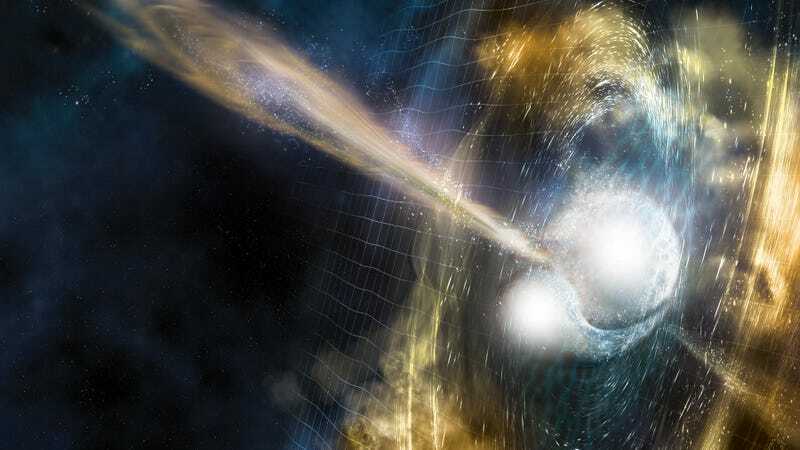 Scientists have known about short and long gamma-ray bursts for a long time, surmising that the short ones must come from colliding neutron stars, but weren’t sure. McEnery then received an email with a subject line in all caps—the bursts had a friend. Two seconds earlier, one of the two Laser Interferometer Gravitational Wave Observatories (LIGO), the one in Washington State had set off an alert from receiving a gravitational wave signal (folks received the alert after the Fermi announcement). Analysis later revealed that the other LIGO detector in Louisiana also heard the signal but glitched and didn’t report it. LIGO’s detectors consist of two L-shaped arms, each several kilometers long. They split laser light into two beams, send them down the arms into mirrors, and merge them back onto a detector. A gravitational wave, a tiny ripple in the shape of spacetime itself, makes the two light beams move in and out of phase with one another as it passes, causing the beams to cancel out and then amplify repeatedly in a wave-like pattern. You may remember back in 2016, the two LIGO detectors reported a waveform that sounded like water dripping from a faucet, the result of colliding black holes. This time, they reported a two-minute-long increase in frequency that took two minutes to finally stop. This wave would be perfectly explained by a collision 130 million light years away between two neutron stars, dead stars so dense that a spoonful would weigh something like the combined weight of all of the humans on Earth. Each star probably had a mass between one and two times that of the Sun, resulting in a black hole a little less than three times the mass of the Sun. They named the event GW170817. The collision would have sent a bright beam of radiation outward in an explosion, called a kilonova, and gravitational waves towards the Earth. The third gravitational wave detector currently sensitive to astronomical sources, Virgo in Italy, did not hear the waves since they were in the detector’s blind spot. This helped the researchers better determine the stars’ location in the sky. “It’s the equivalent of what happens when we drive and use a rearview mirror to see cars behind us,” said Kalogera. Knowing there’s a car, but not seeing it in your rearview, means it must be in your blind spot. Immediately, astronomers brought in other telescopes like the Dark Energy Camera in Chile to locate the flash’s source galaxy—this wide-angle camera could image lots of the sky at the same time. They also brought others like the Very Large Telescope in Chile, the space-based Chandra X-ray Observatory, and Hubble to answer more specific questions. The color spectrum from the optical light observations, for example, revealed a direct fingerprint that the two stars left behind an enormous cloud of elements like gold, platinum, and uranium, whose origins were previously unconfirmed, Harvard astronomer Edo Berger told Gizmodo. The radio waves and x-rays let scientists know that the gamma-ray burst was joined by a high-energy jet of particles. But questions remain. “What we thought we knew about short gamma-ray bursts might not be the full story,” McEnerey told Gizmodo. The gamma-rays weren’t as strong as they should have been, for example—but other measurements confirmed that the neutron stars were surprisingly close. Maybe we just weren’t in the jet’s line of fire. This would be bolstered by the fact that neutrino detectors didn’t spot any of their tiny, charge-less particles. Physicists also wondered why there haven’t been any black holes between three and five solar masses, or what happened after the neutron stars collided—did they immediately collapse into a black hole, or stick around as a larger neutron star for a little while? The announcement was clouded in secrecy. Rumors swirled, and many thought another press conference held several weeks ago would hold today’s news (instead it just announced another black hole merger from August 14). Nature News correctly guessed the source in an article from August after a scientist leaked the information on Twitter. The papers, published in several journals including Nature, were not distributed to journalists prior to today’s press conference like they usually are, making it difficult to accurately report on the story. Promises to distribute any materials at all prior to the announcement were delayed. All in all, the discovery marks an important milestone in gravitational wave astronomy and proof that LIGO and Virgo do more than spot colliding black holes. At present, the detectors are all receiving sensitivity upgrades. When they come back online, they may see other sources like some supernovae or maybe even a chorus of background gravitational waves from the most distant stellar collisions. And physicists expect to see these types of neutron star events as often as once a month. “That’s both extremely exciting and really terrifying because of the amount of effort and energy to study just one of these events has occupied us for two months,” said Berger.